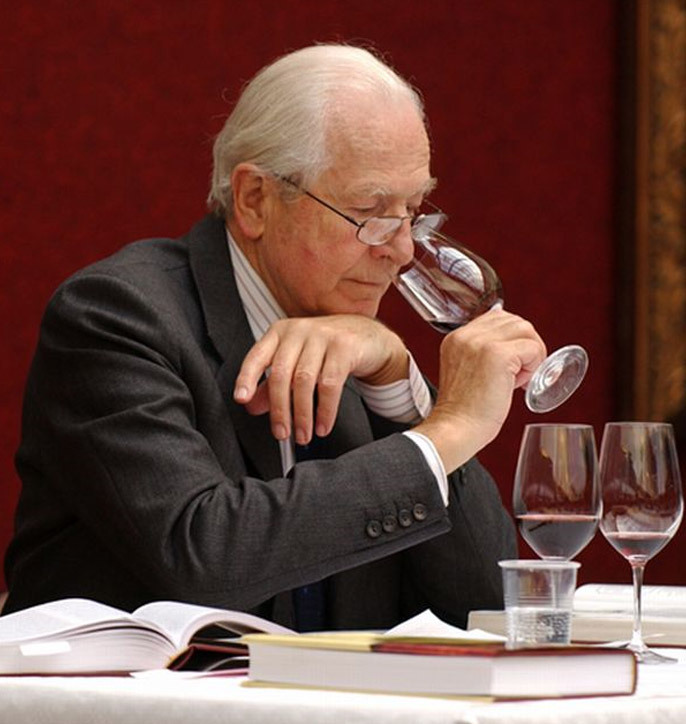 The Englishman Michael Broadbent (born 1927) is one of the most famous wine degustators and wine writers in the world. In 1948 he began studying architecture, but he finished and began in 1952 at the wine merchant Tommy Layton as a wine trade apprentice. In 1955 he joined the company Harvey's where the famous wine expert Harry Waugh (1904-2001) was his teacher. Here he brought it up to the sales director for Great Britain. In 1966 Broadbent moved to the famous auction house Christie's in London and became director of the wine department. Here it was and still is countless Auctions responsible. In 1970 he became chairman of the "Institute of Masters of Wine," the title Master of Wine he won in 1960. Furthermore, he was an honorary member of the "Académie du Vin de Bordeaux". In 1984 he received the "Grand Prix de l'Académie International du Vin". His famous wine book "Wine Tasting, Knowing and Enjoying" (Wine Tasting 1960) is an international classic and longseller and has already enjoyed over 40 editions in ten languages. For the British magazine Decanter he has been writing monthly articles since inception. From 1986 he was president of International Wine & Food Society and since 1991 Chairman of the Supervisory Board of the "Wine & Spirit Trades Benevolent Society". Broadbent has tasted over 70,000 wines and has meticulously recorded this in over 110 notebooks. In it he not only notes wine notes, but also the occasion, the people present, the food and in addition also visual and atmospheric impressions. These notes are a remarkable historical document describing great wines of the world dating back to the early 18th century. In 2004 the German edition of the comprehensive book "50 Years of Tasting the World's Finest Wines" was published. At the tastings, he almost never swallows. By his own account he is at Weingenuss very moderate and was very rarely drunk. He says, "For me, every tasting is a revelation. Actually, it's the wine that talks. I'm just getting the translation. I see myself as a chronicler and communicator, not as wine critic " . In the area of wine review and when asked "which wine suits which food" has Michael Broadbent brought to a true mastery (see also under Wine to food ). However, his rating does not take place by means of one of the common scoring systems, but in the form of one to five stars. This page was last modified at 5 October 2017 at 14:07.